Welcome to our class blog. We will share information about our classroom happenings through writing together. 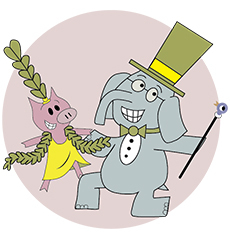 Elephant & Piggie's﻿: We Are In a play! We were so excited today. We are going to a play!!!! We got on the bus. Mrs. Carr's class was on bus #100. The bus driver drove us to the children's theater. We got there. We had to wait for the first show to be over. The bus driver played a guessing game with us while we waited. Finally, we went into the theater. We sat in our seats. The director came and talked to the audience. He helped us practice clapping, laughing, and not talking during the performance. He told us we needed to be silent. And we should enjoy the play. The floor was painted to look like a book and there were even speech bubbles on the floor. The play started. Gerald was looking for Piggie and Piggie was looking for Gerald. And then they bumped into each other. Piggie and Gerald sang some songs. The Squirrels came and sang and danced too. They acted out the different Elephant and Piggie books. They did "I Love My New Toy", "Should I Share My Ice Cream? ", "We Are In a Book", "I Am Going", "I Am Invited to a Party", "Listen to My Trumpet", and "Elephants Cannot Dance". At the end, they realized they were in a play and said they could make us do anything. They made us all clap, they made us say the word "banana", and we had to wave our hands in the air. Then, just the boys clapped, the girls said "banana", and the grown-ups had to wave their hands in the air. We really liked the play. We actually LOVED it! When it was over, we went back on the bus and went back to school. First Grade writers in room 207 sharing their thinking with their readers.